The couch again but filled with bodies. Our new sectional couch. Empty! Here it is with family all around. We can fit quite a few, as you can see. 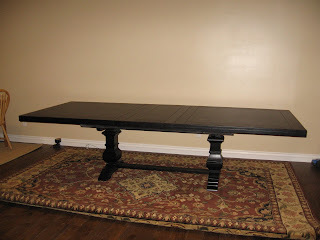 Here is our new diningroom table all ready for dinner. steps that go down into the yard(that will someday be there again). Hey, it's starting to look like a real deck. Noone is exempt from working. This is an equal oppurtunity job. We got Shauna and Stacey to do their part. It was definitely a learning process and it took a while especially at the beginning. Here is another view showing just how big this deck will be. This is the start of our Trex deck. Here is our builder and Bill working on our patio cover. 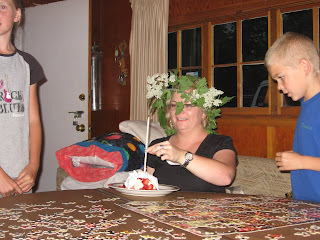 Here we are celebrating Stacey's birthday up at the cabin in Logan. The kids made this beautiful flower wreath for her head. We had strawberry shortcake and we didn't have any candles so this fireplace match had to do. 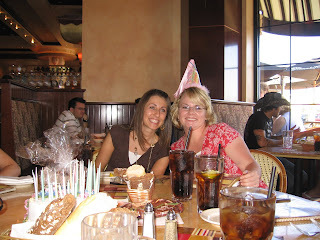 This is at the Cheesecake Factory where family and friends surprised her for dinner. This is her friend from work, Melody. Here is my beautiful new headboard. The very first headboard Bill and I have ever had. I love it! Here is our bed with the lovely Stacey posing on it. Dad got an upgrade from the tv on the right to the TV on the left. He has patiently waited until he returned to Utah to get this 60" TV for our bedroom. This is our master bathroom vanity and we decided to use a mirror that we already had and just have to stain the frame a bit darker. Lights have been ordered and we're waiting. This is mine and Stacey's attempt at doing a little decoration on top of the china hutch. I love the trestle legs that give you so much more room. I got a great deal on this, which makes it even better. I decided neither one of my other two tables would do so now we have a third table. It is 9 1/2 ' long and is great. Now I just need chairs. Dad is going to make two benches for the grandkids to use on the side against the wall. 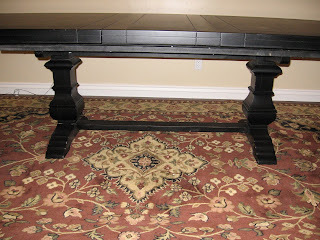 I'm going to try to sell the one table and 8 chairs on ksl.com and use my teak table in my sewing room downstairs. 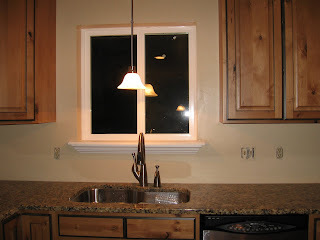 Here is the finished lighting in our kitchen. 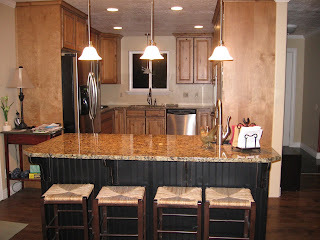 Canned lights and three pendant lights over the island. These are the drapes in our master bedroom. The sheers are light cream and the drapes are a chocolate color. They are on a double rod and are on rings so you just pull them open and closed. 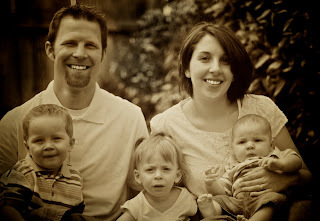 Here is the whole Mark Porter clan. Mark and little Bridger, how sweet! Look at that cute face on Miss Liela! Our two sweet grandchildren, Eli & Liela. Here's Matt and his family when we were in Australia in March of this year. How cool is Adam on this old Honda 90? With gas prices the way they are it's the way to go. Adam didn't think the Honda 90 was enough for him so he got this Honda 400. Here is some of the family on the Susan G Koman, breast cancer 5K walk/run. This is our master bathroom vanity. We still have the mirrors and lighting to finish. After 30 some years I finally got a china cupboard to fill the space we had made for one. Here's Bill putting in some can lighting in the kitchen. One last picture just showing you the back of the house now that the siding is completed. Lots of siding, isn't it? Once we get a deck on and a deck cover it should break it up a bit. That's it for now! Almost forgot to add this picture of our new front porch. We have had a problem with water and snow building up on the porch so this should help.